Pretty Planning with Pockets, by Henny! On my last project with this kit (from a previous post), I showed you this planner's pocket set up as well as the cute dashboard I had done. And now, here is the back side of that dashboard as you can see on the left side of the picture above. I created a secretarial L shape pocket plus one slide pocket on the front, made purposely to get more space to put things like papers, notepads, or paperclips, etc. And on the right side I used one of the papers in the kit that has the princess design on it -- I simply cut her out of the paper, placed her onto a white doily and laminated it. And here is how the back side looks -- I added some words and laminated everything together. Then I trimmed the edges along the doily, leaving about one cm along one side and then punched holes in it to be able to put it inside the ringed planner. The next page is a clear acetate of the confetti design that comes in the kit. 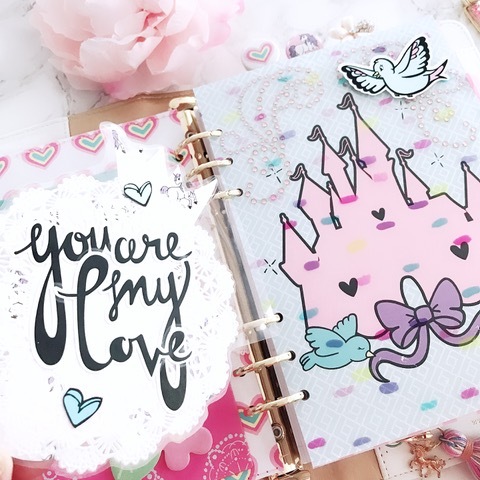 After the confetti acetate, it’s a simple divider paper with the castle design. And then what I did was only to add some bling as we have one beautiful castle picture already which doesn't really need much added to it. And here is the back side -- I created another pocket out of acetate as I simply Love to have more pockets in my planner to allow to put more stuff in! The next page is a slide pocket which I created using 2 of the decorative planner dividers in the kit. I stitched them up together so then we have one slide pocket where you can put anything in it...like receipts, letters, or even your pictures. I am loving all of the beautiful designs from this kit! I’m glad that Andrea provides the digital files to purchase so that you can print out yourself too! I love this moon and star design and printed it out on a vellum paper. Loved it so much! And last is another slide pocket out of 2 of the decorative dividers from that kit which I used and stitched together. So obviously that is one thing I just love! I love making lots of pockets in my planner, simple idea yet very functional! 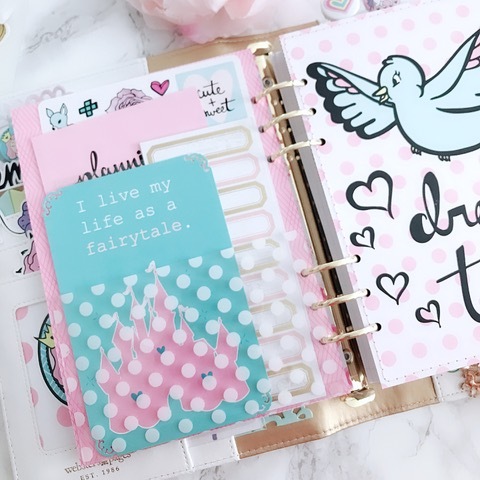 Well I hope you enjoyed reading and seeing my planner project in this post and I hope it has given you more ideas and put you in a crafting spirit to start doing your own pretty planning with pockets and stuff! This Planner project is to be continued... so stay tuned everyone!